Interior parts for 2015+ F55 MINI Cooper Non S 4 door. These parts include gauges, short shift kits, auto up window switches, scangaugeII, scangaugeE, chrome interior trim, shift knobs, ebrake handles, radio accessories, floor mats, rubber mats, boot mat, light in sight, steering wheels, cupholders, aux radio, ipod hookup, arm rest, dome lights, dead pedal, shift lights, sun shades and more. 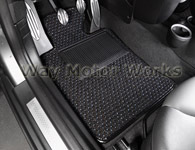 We carry interior parts made by Cravenspeed, Lightinsight, M7, Fes-auto, WMW, Zippee gear, NM engineering, Scangauge, Helix, MINI FINI, John Cooper Works, Dice, OEM MINI parts, CG Lock, Coco MINI floor mats.